Ferrets are cute, furry little thieves, but there is so much more to them than that. If you are considering getting a pet ferret soon, read this first. Do you have a friend with a ferret and are wondering if it would be the right pet for you? 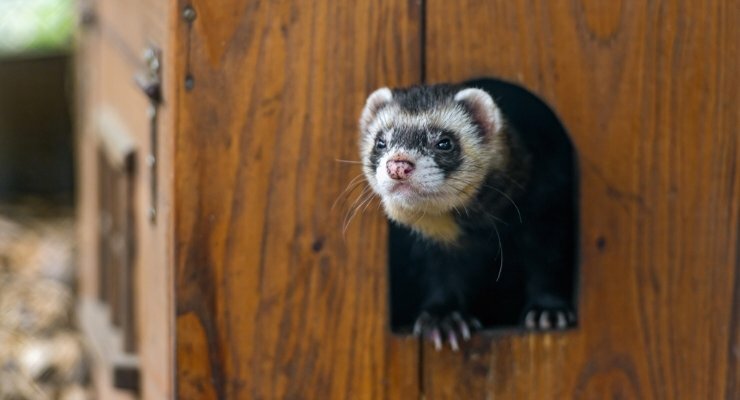 As with any pet, ferrets have their upsides and downsides — but understanding these animals will go a long way toward building an awesome relationship. With that in mind, here are 10 things ferrets probably wish people knew before they are brought into the home. Ferrets are really quite intelligent animals. Just like dogs, they can be taught tricks such as responding to their name, sitting up and rolling over, among others. Ferrets can also be taught (with a bit of perseverance) to use a litter box. Teaching your ferret tricks is not only fun for you both, but also exercises his intelligence. This can be useful if, for example, there is a dangerous situation in which you need your ferret to come to you immediately. 2. Vet visits are not optional. Just as with other domesticated pets, ferrets are susceptible to diseases such as rabies, Aleutian disease virus, heartworm and distemper. Take your ferret to a veterinarian regularly to ensure that he is up to date on his vaccinations. Ferrets can also contract the flu (influenza) via human transmission, so be careful when handling your ferret if you are not feeling well. Ferrets love companionship! They will want to play with you as well as other ferrets and will get lonely if neglected for too long. Set aside time every day to interact and play with your pet. You will find that your ferret bonds with you more strongly the more time you spend engaged in fun activities. Be warned — ferrets are notorious toe chompers. When a ferret runs up, bites your toe and runs off, she is not usually expressing displeasure but rather inviting you to play with her. When ferrets interact during playtime, one will usually bite the other and run off to initiate a chase. A bite to another ferret is usually hindered by thick fur, so your ferret will assume that your toes have the same sort of protection. Ouch! Biting can be discouraged with careful training and positive reinforcement…but definitely invest in some closed-toe shoes as well, just in case! 5. Fleas are not friends. Ferrets can and do get infested with fleas. This is something you need to be vigilant about eliminating right away. Not only are fleas miserable for any pet because of the excessive itching, skin sensitivity and possible disease transmission, but ferrets can also contract anemia. Being smaller animals, enough fleas on your ferret can cause him to become severely anemic. Discuss with your vet how to handle flea issues before they arise. Ferrets often cannot handle regular doses of the usual anti-flea medications given to dogs or cats, so please do not apply a dose of medication without clearing it with your vet first. 6. These claws don’t trim themselves. Ferrets need regular attention paid to their wee little feet. While cats often use a scratching post and dogs wear down their claws naturally by walking on pavement and such (both still need attention paid to their feet), ferrets usually do not have the option of wearing down their claws naturally because they are domesticated. Claws should be trimmed regularly to ensure that they do not become too long. When the claws get overly long, they can tear or even snag on something and cause a broken toe. 7. Small spaces and stealing are awesome. It is important to ferret-proof your home before you allow Frankie the ferret out of his cage for playtime. Ferrets love to get into tight spaces and will often get themselves stuck in areas you wouldn’t believe. Cover up areas such as beneath the couch, gaps between the furniture and the wall, holes and access to anywhere you don’t want your ferret to be. Cover up outlets with child safety prongs, remove anything from the floors or surfaces that your ferret could choke on, and hide anything that you don’t want to be stolen. Ferrets are wonderfully inquisitive, and they’ll gladly make off with your shiny earrings and hide them! Ferrets can easily get heatstroke. Ferrets suffer when the heat around them is 80 degrees or higher and can get sick. They don’t sweat like we do, and they don’t pant like a dog or even a cat will. When you leave for work, make sure that there is someplace cool in the house for your ferret even if you have to leave the air conditioner on. 9. I can’t eat just anything (even though I might try). Ferrets are carnivores. They function best on a diet of food that is high in protein and moderate in fats. Carbohydrates should be very low, and ferrets should not eat things that are sugary or have grains, corn, rice, bananas, peanut butter or dairy products. Consult your vet about the best food regime. 10. Let me run around. Last but not least — cage time! Ferrets do not want to spend their entire lives cooped up in a cage. It’s depressing and just no fun at all. Some people allow their ferrets full run of the house or certain rooms at all times. In order to keep your ferret healthy and happy, you should dedicate at least 4 hours a day to playtime where he is out of his cage. In addition, dedicate 2 hours to human interaction. You want to make sure that your ferret is comfortable with human handling and remains social. This is a pretty big list, I know! Ferrets are wonderful pets who have their own set of quirks, much like a dog or a cat. Keep these things in mind when you’re getting your own pet ferret, and both of you will be much happier for it.